The tour starts with a walk in the Wenceslas Square in the NEW TOWN, continues along the Royal Route to the OLD TOWN Square with Astronomical Clock and through the JEWISH QUARTER with its synagogues to the Vltava River embankment, where our restaurant boat is waiting for you. While you are enjoying delicious lunch on board, you will be taken on a 1hour voyage through the heart of the city. Your guide will provide you with informative commentary about the city and its landmarks. Nicely relaxed, you will continue by bus through the LESSER TOWN (Malá Strana) to the Infant Jesus of Prague statue. You'll ride the popular funicular up to the the top of Petřín hill to the Petřín Lookout Tower, a smaller copy of the Eiffel Tower in Paris. After a stroll through Petřín Park you will arrive at the Strahov Monastery where you can enjoy gorgeous views of the Prague Castle and the city center. Our walk takes you further to the Loretto Cloisters and the PRAGUE CASTLE, where you can admire St. Wenceslas' vineyard and unforgettable panoramic views. Finally, you will descend through the Lesser Town and Kampa Island. 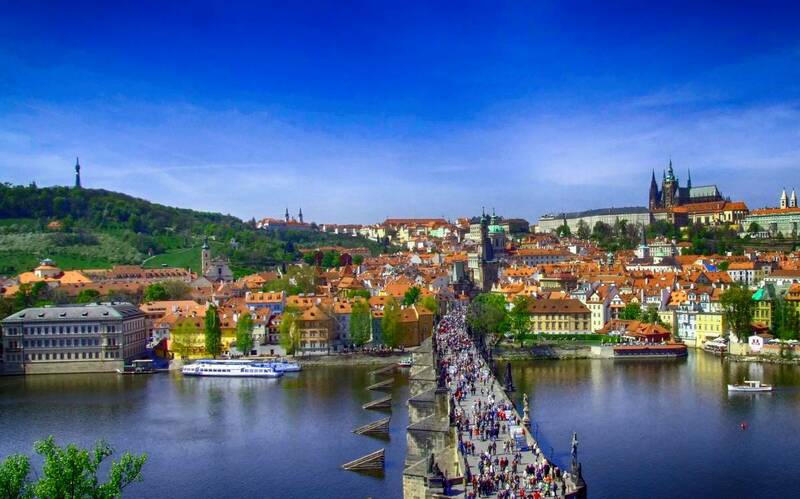 Your tour ends at the historic Charles Bridge, dating back to 1357. 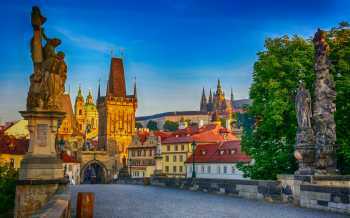 The tour is a combination of a comprehensive trip by bus, walking, an hour-long cruise on the Vltava River, and a cable car ride to Petřín Hill. The tour can be conducted in 6 languages - English, German, Spanish, Italian, Russian or French. It is always guaranteed to be in one language. Did you know that Petrin Tower is only two years younger than its inspiration, the Eiffel Tower? Did you know that the cable car ride to the top of Petrin Hill has operated for more than 100 years? Did you know that the Church of Our Lady Victorious serves Mass in 4 languages?